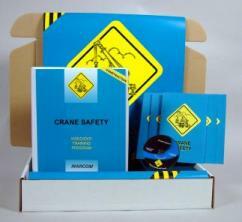 MARCOM's Crane Safety in Construction Environments Construction Safety Kit points out to employees that over 90% of crane-related accidents are caused by human error... and that they are the key to preventing these incidents. While there are many different types of cranes, they all have the ability to make many jobs much easier by lifting enormous weight. But they also share the potential for disaster when they are not operated safely. Crane-related accidents can often be deadly, due to the cumbersome and heavy loads that are lifted. A small miscalculation, or a brief moment of inattention, and tragedy could strike. Once a load falls, not much can be done to stop it, and there is little time for people to move safely out of the way. A coworker could be injured or killed, and expensive equipment or materials could be damaged or destroyed... even the crane itself. Materials in the kit include a DVD program, five motivational posters, and 30 employee booklets. The posters in the kit remind employees of the importance of crane safety. The DVD program and the employee booklets include information on recent changes in the OSHA regulation, certified operators, equipment inspection, hazard assessment, boom cranes, jib cranes, overhead cranes, general and operational safety devices, crane operations, hand signals, working around power lines, and more. The DVD program in the kit comes with a comprehensive leader's guide, reproducible scheduling & attendance form, employee quiz, training certificate and training log.